Once Again a Crazy Cat Lady - Kellbot! | Kellbot! I am a part-time cat lady. Most of the year, I am too busy to be willing to deal with a pet. But during kitten season the local shelter posts photos of homeless kittens on their Facebook page, and I am powerless to resist. 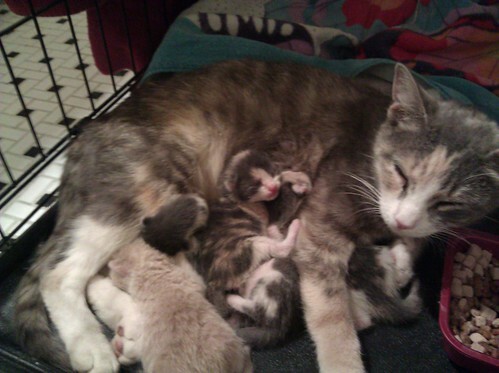 This time, I went in to pick up what I thought was a family of a mom and 3 kittens who were about six weeks old. 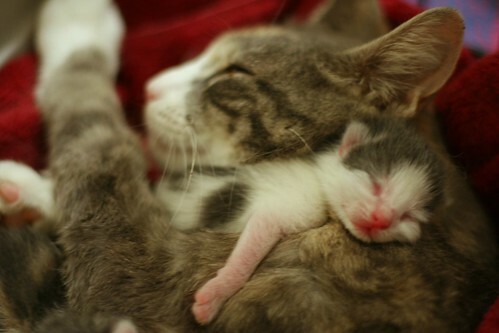 I left with a box with a mother and 5 kittens, whose eyes were still closed. At this size, they’re almost too little to be cute. Almost. As many of you know, I have terrible luck with foster cats. There is always some sort of medical emergency. I am assured that this is because all stray kittens are horribly broken, and at least at home they can get better care, but still. Why I thought this litter would be different is beyond me. But before I tell the story of Yet Another Cat Emergency, here’s a video of the kittens this morning. They are looking cuter and fuzzier today, and their ears are starting to look like ears. Ok, so cat drama. After eating some and drinking some, I noticed Mother Goose, the mom cat, sitting off to the side of the crate, away from her babies. Then when one kitten started crying, she stood up… and I could see she was sitting in a pool of blood. COMMENCE FREAKOUT. After a panicked call to the vet, I learned two things: the kittens were less than 48 hours old, and it’s “not uncommon” for queens to bleed for a few days after giving birth. I was given a checklist of a few signs to look for that would indicate problems (Mother Goose had none), where to buy levitra and then proceeded to clean up the omg eww cat blood. Chris then informed me that a similar thing happens to humans after giving birth! Oh, great! So much to look forward to!